MOAA organizes, facilitates, and participates in a wide range of educational outreach programs designed to ensure that community members are aware of, and gain access to District services and resources. In Washington, DC, we value diversity and inclusivity and the Bowser Administration remains steadfastly committed to supporting DC’s immigrant community and ensuring all Washingtonians feel welcome and secure. MOAA announces a funding opportunity for eligible community-based organizations serving Africans in the District. MOAA engages African youth through programs that highlight leadership, employment, civic engagement and participation, and social integration, while providing the platform for interactive discourse on issues pertaining to African youth. MOAA recognizes and respects the broad diversity of the District’s African residents and works to promote awareness and appreciation for the rich multiculturalism of this community. Engages African youth with various programs. Organizes and facilitates cultural events, dialogues, and discussions focusing on diversity. Facilitate programs to ensure that community members are aware of District services. Support local entrepreneurs, small businesses, and African community oriented organizations. 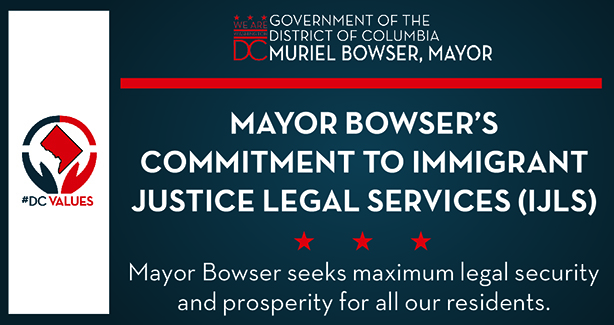 The Executive Office of Mayor Muriel Bowser is dedicated to serving all DC residents, including our vibrant and diverse communities of immigrants. Through Know Your Rights town halls, liaison units and her signature Immigrant Justice Legal Services grant program, the Mayor is committed to ensuring that all DC residents feel welcome and valued. VA - Virginia State Bar or click here for disciplinary history. Co-branded FAQs and information sheets, such as the Ayuda brochures and notario fraud videos. Consulates can help people find where a family member is detained, or even provide legal defense support. Be aware that consulates are required by law to be notified by United States federal, state and local government offices when one of their nationals is detained. Note: It is a person’s individual decision whether they also wish to reach out to their consulate. Individuals with asylum claims may not wish to do so. Please free to contact any IJLS grantee, once you have a look at the project descriptions, or see the DC Bar for more organizations. In addition, the following DC organizations offer citizenship assistance. Information about any immigration-related events in the District, including upcoming clinics, as we are asked to share them. The list should also include upcoming citizenship workshops.